Joint Task Force-Bravo hosted Exercise Central America Sharing Mutual operational Knowledge and Experiences (CENTAM SMOKE) 2018-2 at Soto Cano Air Base, September 10-14, with firefighters from the 612th Air Base Squadron fire department and 30 participants from Honduras, Guatemala, Panama, El Salvador, Belize and Nicaragua. The ceremony was presided by Col. Kevin Russell and Command Sergeant Major Robert Keith, JTF-Bravo leadership who joined Lt. Col. Damon Matlock, 612thcommander in congratulating participants. 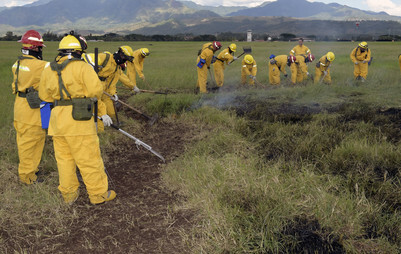 The 612thinstructors prepared four days of intense fire and rescue training to develop team building cooperation skills, as well as improve partner nation firefighting capabilities and disaster response coordination. Throughout the week, the multifaceted training included equipment familiarization, safety, structural and helicopter live fire evolutions, vehicle extrication, aircraft familiarization with Bambi Buckets and wildland firefighting. “We are very proud to be here. This is an unforgettable experience; we’ve learned a lot of new techniques that we were not accustomed to in our country but now we can implement them. We can always learn something new and we are very happy and very grateful,” said Victor Balan, a firefighter with the Belize National Fire Service. The Salvadoran team won first place during the obstacle course challenge, which resembles the fire muster challenge, and received an award during graduation. During the graduation ceremony, Master Sgt. Michael Ott, Deputy Chief, 612th Fire Department, motivated participants to share the lessons learned and to become force multipliers for their units. “This week we all joined together for a training event to better understand how we operate independently so that one day if called upon we can operate jointly. I challenge you to take back the lessons and tactics that you’ve learned this week and share the information, set up training events and help educate those who could not make it this week. Help your departments be better each day to benefit your community” said, Senior Master Sgt. Michael Ott, Deputy Fire Chief, 612th Air Base Squadron. CENTAM SMOKE provides an opportunity for all firefighters to work as a team and build relationships among partner nations to develop the capability to respond together in the event of a crisis in the region. “We as firefighters always find a common bond and a way to work together. We have an international firefighter language. No matter where you are from the foundation of our language revolves around the service to our community and the dedication to protecting others,” said Ott.